I just walked into the Clinic to start my shift, when one of the LVN’s approached me and asked me if she could confide with me and ask for my opinion at the same time. “What meds did you give?” I asked. She told me it was for seizure. I told her it shouldn’t hurt him not unless, he would be allergic to those meds. But she should take his vital signs and record what happened anyway in the nurse’s notes. In case that man later on, decided to say something against her, her notes would back her up. He shouldn’t have taken the meds anyway because she was calling another inmate’s name. “I got upset with him. I told him, why did you show up when you knew it was not your name?” she added. Fortunately, the inmate turned out to be okay and was in no harm. Yet, the LVN, feeling comfortable with what I told her, still put him up for the doctor to be checked out to make sure that he would be completely okay. Her only fault…she failed to check the inmate’s ID before even giving the pills. “Be careful…be very careful next time even if something goes chaotic. Focus on what you need to check before you give out these meds. Like what I said, I know you. You‘ve been a great nurse here and focus on keeping that good job. Learn from that mistake,” I advised. 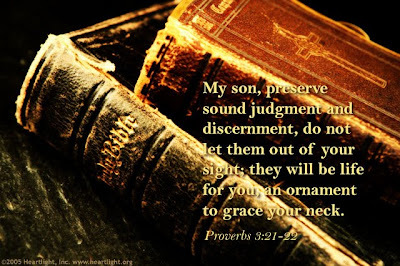 Discernment….The dictionary says it means “keenness of insight and judgment.” In our spiritual life, we also need spiritual discernment. It is calling on the Holy Spirit to lead or give direction about a matter. It’s more than a learned skill. Spiritual discernment is a gift from God. Yet, we use our skills or gifts in which the Spirit can work through to help us discern rightly. We can be knowledgeable with the Scriptures, but some of us are not willing to be taught by the Spirit. In doing so, we are not learning discernment. We are not seeking the truth. What good is that knowledge if we are not willing to surrender to the leading of the Spirit? How can we discern evil from good, if we rely on our own judgment? It’s only by His grace that we are able to do that. Like in the jail, we all follow protocols in many skills that we have to do. Same thing when it comes to discerning God’s will. It’s not only for me. It includes you, all of you, the church.